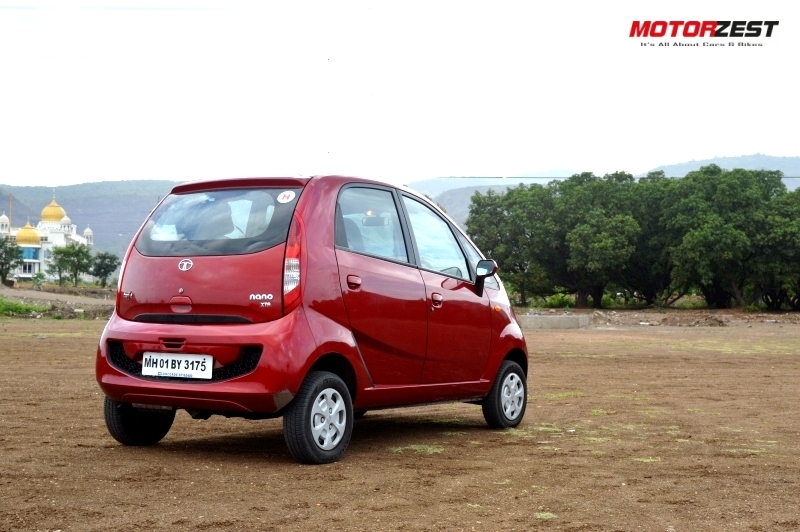 The Nano GenX marks a giant step forward by Tata Motors towards changing the image of Nano in the consumer’s mind. It is no longer a 1-lakh rupee car and it is neither portrayed as one by Tata Motors. It is modern, stylish and smart car meant for the urban commuters. It no longer looks or feels cheap. It is fairly loaded with modern features that you would expect in any entry-level premium car. We drove the GenX Easy Shift XTA (the one with AMT) over 350 kilometers in various driving conditions like city traffic, empty highways in hot sunny afternoon as well as heavy rainfall conditions. The Nano GenX looks very distinct from the previous Nano although the silhouette still remains the same. A big smile-like grille on both the bumpers is what primarily sets this one apart from the previous versions. A moustache-like black strip on the bottom edge of the hood and smoked headlamps gives it a refreshing modern look, a smart city hatchback look. Two major changes in the interiors for the GenX, the classy-looking steering wheel and rich-to-touch premium looking AMT gearknob, both sourced from the Zest. These two updates give the driver a feeling that he is driving a premium car and that’s a big feel-good factor that Tata has smartly introduced in the GenX. The top-end variant XTA that we tested had a beige-black colour configuration for the interiors which blends well and exceeds expectations to say the least. 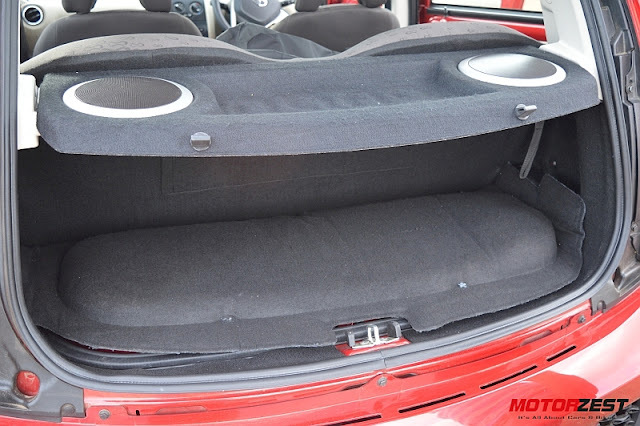 Another radical change in the GenX is the boot space. Yes, you read it correct. 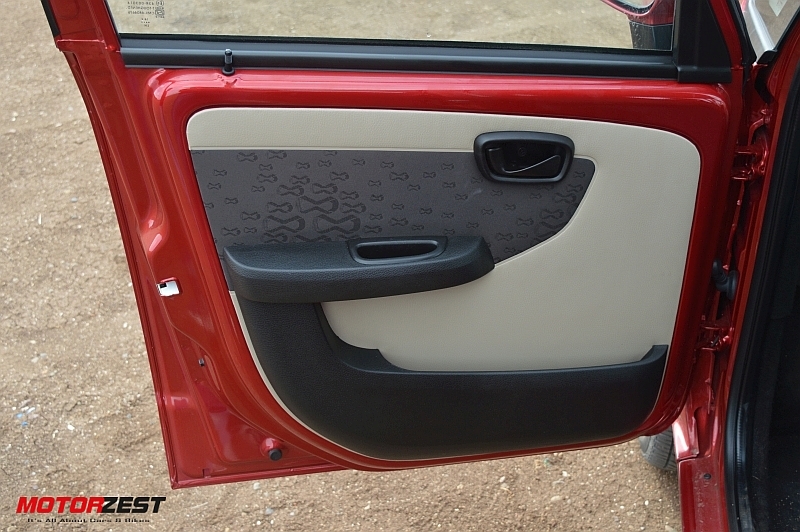 The GenX Easy Shift comes with a 94-litres boot space for your luggage (110-litres in case of the non-AMT version). Nano GenX isn’t a car made for the thrill of driving and thus scores low on the performance rating. The maximum we pushed the GenX was 104 kmph beyond which we felt the car to be highly unstable. The maximum speed that one can cruise on the highways is just 80 kmph over which it would not be safe to cruise. Although the lack of clutch makes driving in the jammed city streets a breeze, the AMT gearbox isn’t that refined or smooth. Jerks are quite distinctly felt when the smart algorithm misses few steps and downshifts a bit too early. The AMT also falters while up-shifting and you just lose power when it up-shifts a bit too early making an overtaking maneuver quite risky. But thankfully, a Manual shift option is also provided and you can decide the gears all by yourself just like in a manual transmission albeit the clutch. There is also a small button named ‘S’ located below the gearknob, which when pressed activates the ‘Sports’ mode. In this mode, the engine becomes more peppy and sensitive to the accelerate pedal activation. In short, the engine responds quickly and revs more before the AMT shifts the gear up. Thus, giving you a feeling of more power between the gears. 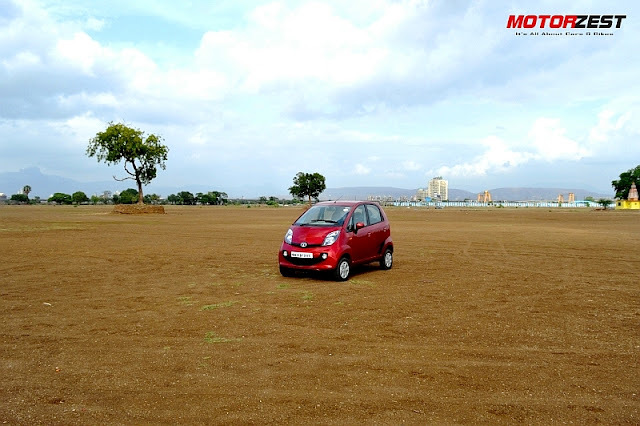 Hard cornering, aggressive acceleration, hard braking & overtaking is a complete ‘No’ in a Nano. The ‘tall body + small wheels’ configuration means that there is ample of body roll even at moderate speeds. In the automatic mode thanks to early up-shifting tendency of the AMT, aggressive acceleration is non-existent. Surprisingly, a very important downside of this GenX is its inability to brake hard when in speeds above 60 kmph. The brakes take their own sweet time to slow down the GenX , which is a serious concern if you are used to applying your brakes aggressively late. This is one area where the GenX Easy Shift has lots to improve. We were very disappointed to find out that the GenX churned out an average fuel consumption of just 11 kmpl when driven in the automatic mode in city traffic conditions (not even the Sports mode). This figures improves a lot on highways giving you around 18 kmpl in the same automatic mode. The fuel economy get slightly better if you drive it in the manual mode but that’s not the reason you have bought this Nano Easy Shift, to shift gears manually. One point I would add in this section is the ease of driving. The GenX Easy-shift makes driving in bumper-to-bumper traffic as easy as a walk in a park. 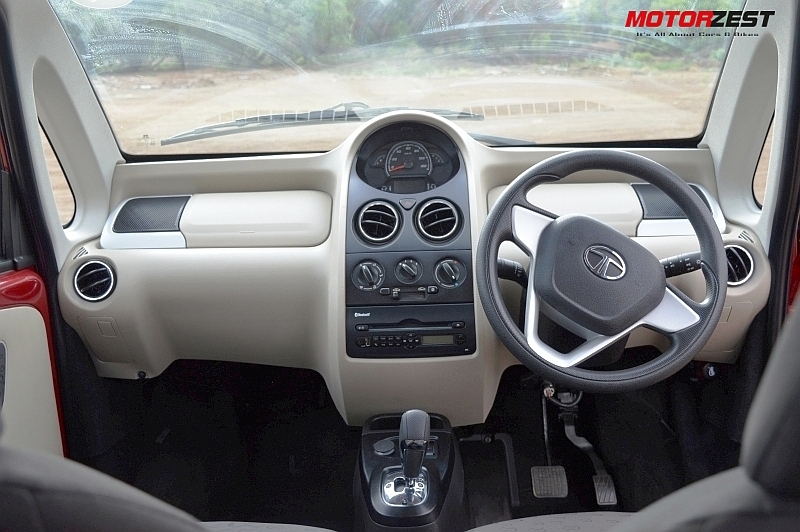 Feather-light steering wheel (power-assisted) and clutch-less AMT gearbox makes life easy in the traffic. The suspension did impress us very much as it handled the rough roads pretty well aided by its more than enough ground clearance. The seats aren’t that comfortable for long drives but serve the purpose well enough in short city commutes. No height adjustable driver seat, no tilt-adjustable steering wheel, but that’s fair enough given the price. The HVAC (air-conditioning) system works fantastic keeping everyone cool inside even in extreme hot driving conditions. 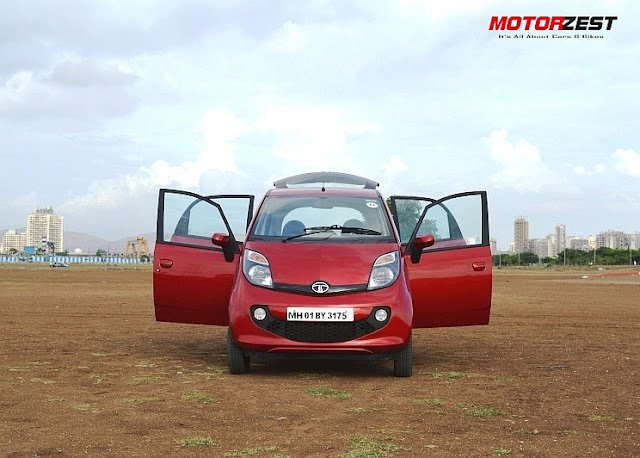 The Nano, despite its small size from outside, scores very well in terms of legroom and headroom for both the front as well as rear passengers. A 6-ft tall person can easy sit inside and even drive it for hours without complaining of stiffer leg or neck muscles. Long drives obviously are not that comfortable for your family, but for intra-city commute it not a big issue. The Nano GenX has certainly improved a lot upon its predecessors and with the introduction of AMT it makes a lot of sense to go for it to satisfy your daily intra-city commute. We are really impressed with the easy of which one can drive this car around the town and certainly recommend it for your daily short trips, making your ride ‘easier, pleasant and safer’ (when compared to using a two-wheeler/scooter for the same purpose). But then, one must also take into consideration the price. The GenX retails from Rs. 219,349 for the non-AMT base variant and goes upto Rs. 313,000 for the top-end AMT variant which is quite on the expensive side.